The Valley confining unit consists mostly of low-permeability glaciolacustrine silt and clay (Qla). 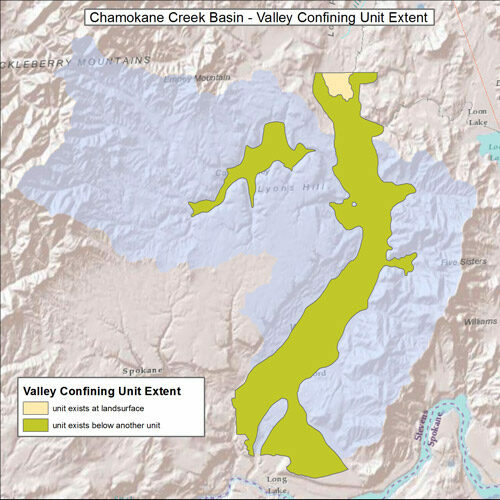 The unit occurs at depth throughout the Camas and Chamokane Valleys and is continuous northward into the Colville Valley. Discontinuous lenses of sand or gravel within the unit contribute usable quantities of water to some wells. Coarse-grained lenses within the VC appear to be more common in the southern part of the basin where Missoula flood deposits following the Spokane River drainage are interbedded with the glaciolacustrine deposits. 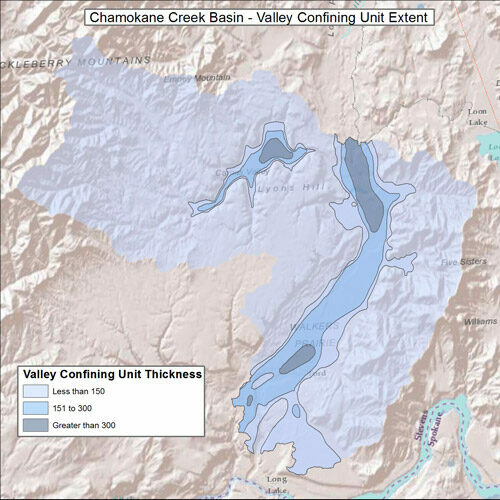 Thickness of the Valley confining unit commonly is 150 to 300 ft along the Camas and Chamokane Valleys and exceeds 300 ft in the central Camas Valley, Swamp Creek area, and near Ford. Two data sets are available, 1. Chamokane Valley Confining unit extent, and 2. Chamokane Valley Confining Unit Thickness. Both data sets are from USGS Scientific Investigations Report 2010-5165.